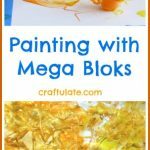 I love finding new ways of painting without using brushes – almost as much as I love upcycling household items to use as art materials! 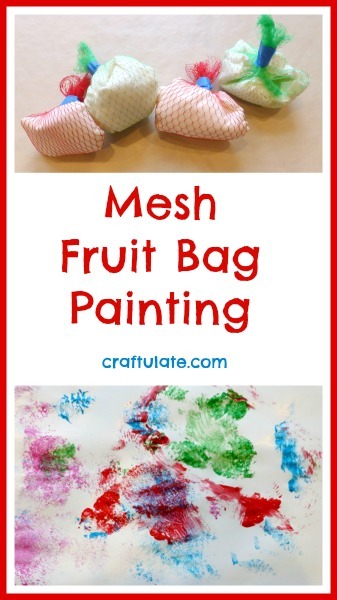 Here’s our mesh fruit bag painting activity. I am so happy that I have finally found a use for these fruit bags! 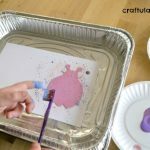 To make the paint dabbers I folded up pieces of kitchen paper and stuffed them into the bags. This formed a flat printing area. I secured the mesh bags with tape – and this also provided a convenient handle, too! I set out the mesh bags, some paint and a large piece of paper. F was actually really gentle with the dabbers, and got lots of lovely prints from the mesh. This would make some really interesting wrapping paper! The only downside to these paint dabbers is that they don’t really lend themselves to reusing, so I had to throw them away after he had finished. But I guess as they were upcycled in the first places that isn’t so much of a big deal. 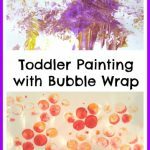 This article was originally written for Cocktails with Mom. Do you like this craft? 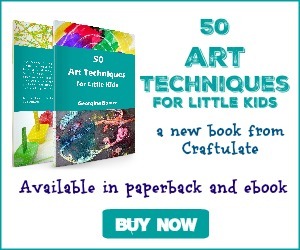 You may also like this book: Green, Crafty & Creative! Get your copy today!